Does God still play an active role in the world today? Readers are thrilled to discover that yes, he does, showing himself in countless miracles and unexplained events. In their signature style, trusted pastor Jim Garlow and writer Keith Wall tap into readers' fascination with miracles by gathering exciting, credible true stories of God's supernatural activities in the lives of everyday people. These stories will encourage and inspire, making this a great gift or impulse buy. 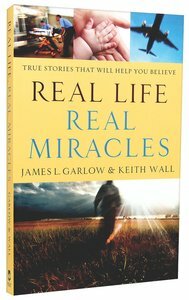 About "Real Life, Real Miracles"
James L. Garlow (Ph.D., Drew University) is the co-author of Cracking DaVinci's Code, with a half million copies in print. He is the senior pastor of 3500 member Skyline Wesleyan Church in San Diego and a speaker at pastors' and leaders' conferences. He speaks nationwide and has appeared on CNN, MSNBC, CNBC, FOX, and NBC. His daily radio commentary, The Garlow Perspective, can be heard on nearly 850 radio outlets. Jim and his wife are the parents of four children and live in San Diego, California. Keith Wall, a twenty-year publishing veteran, has served as an editor for Focus on the Family, Multnomah, and David C. Cook. He currently writes full time in collaboration with several bestselling authors. He and his wife and two children live in Colorado Springs, CO.